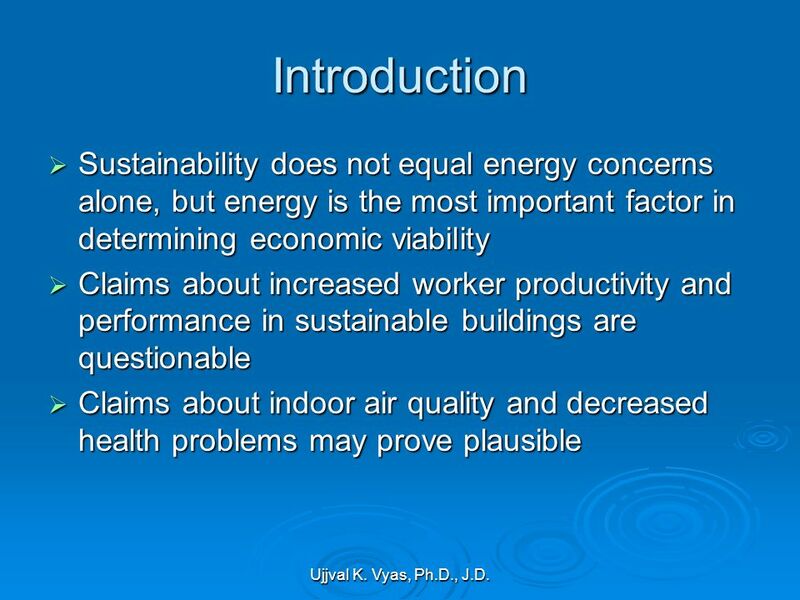 An Introduction to Sustainable Building: Risks and Opportunities BCBEC Presentation May 25, 2006 May 25, 2006 Ujjval K. Vyas, Ph.D., Esq., LEED AP Foran. 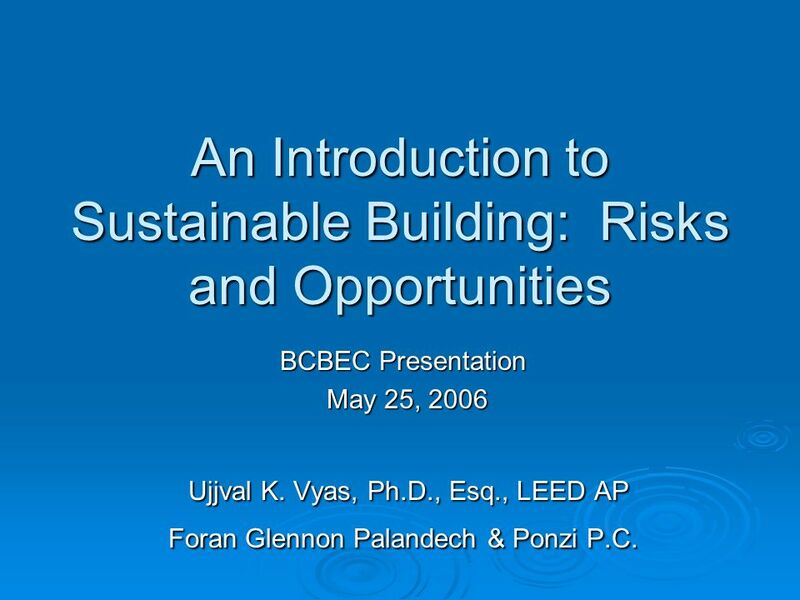 1 An Introduction to Sustainable Building: Risks and Opportunities BCBEC Presentation May 25, 2006 May 25, 2006 Ujjval K. Vyas, Ph.D., Esq., LEED AP Foran Glennon Palandech & Ponzi P.C. 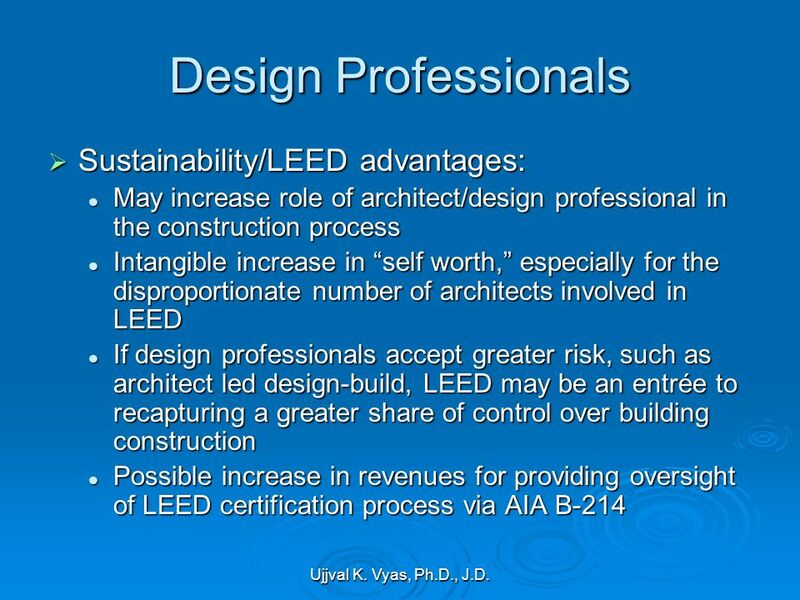 Ujjval K. Vyas, Ph.D., Esq., LEED AP Foran Glennon Palandech & Ponzi P.C. 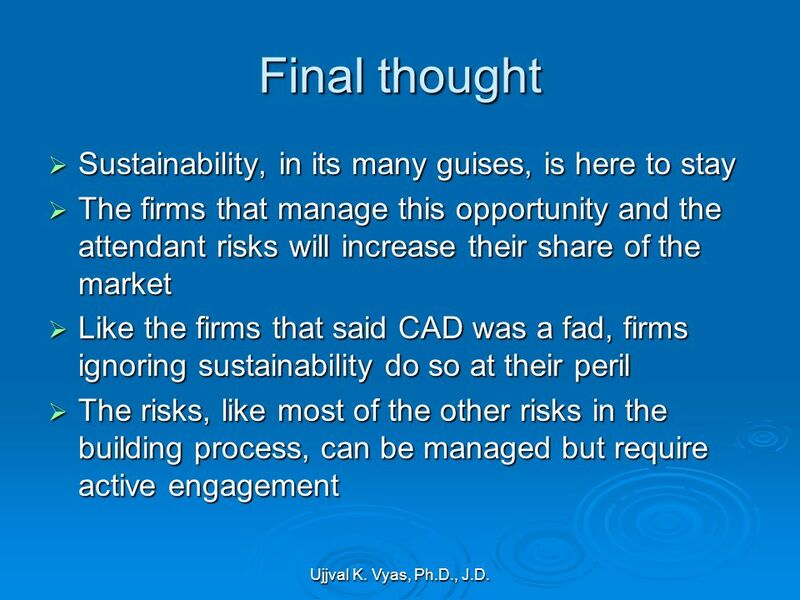 3 Ujjval K. Vyas, Ph.D., J.D. 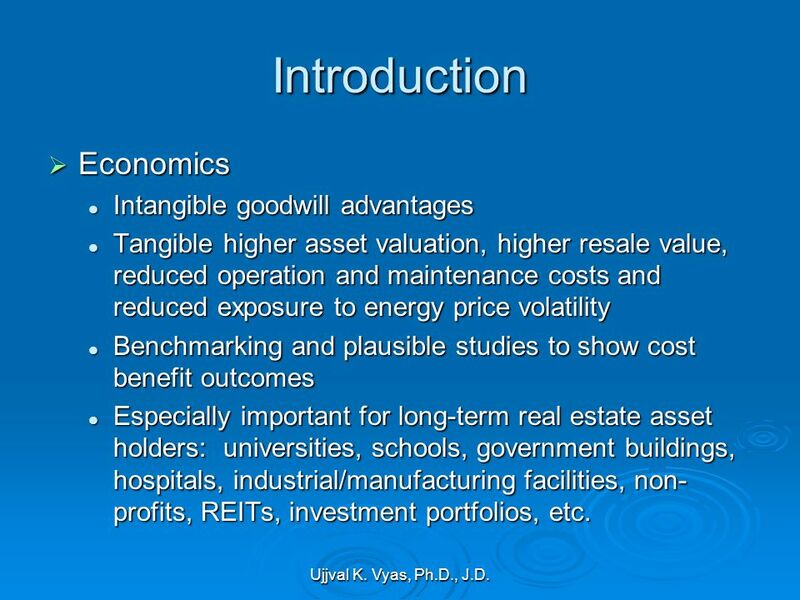 Introduction Economics Economics Intangible goodwill advantages Intangible goodwill advantages Tangible higher asset valuation, higher resale value, reduced operation and maintenance costs and reduced exposure to energy price volatility Tangible higher asset valuation, higher resale value, reduced operation and maintenance costs and reduced exposure to energy price volatility Benchmarking and plausible studies to show cost benefit outcomes Benchmarking and plausible studies to show cost benefit outcomes Especially important for long-term real estate asset holders: universities, schools, government buildings, hospitals, industrial/manufacturing facilities, non- profits, REITs, investment portfolios, etc. 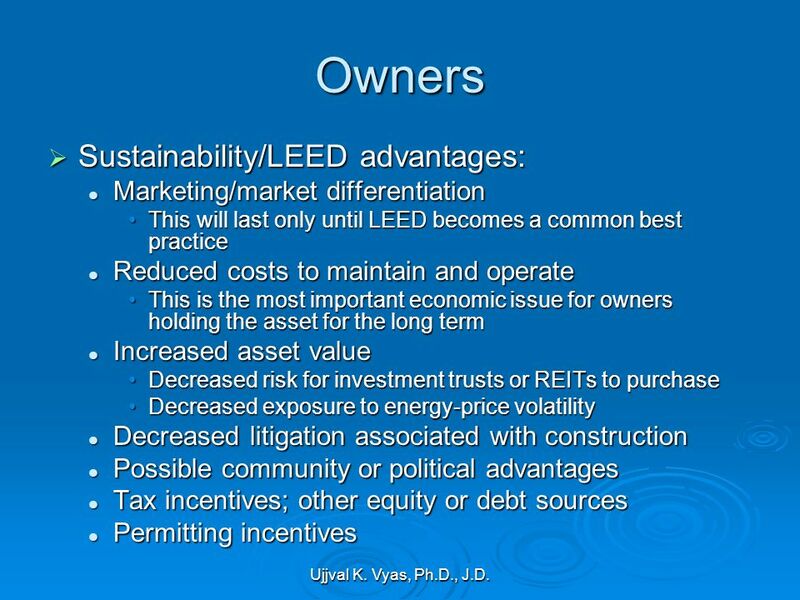 Especially important for long-term real estate asset holders: universities, schools, government buildings, hospitals, industrial/manufacturing facilities, non- profits, REITs, investment portfolios, etc. 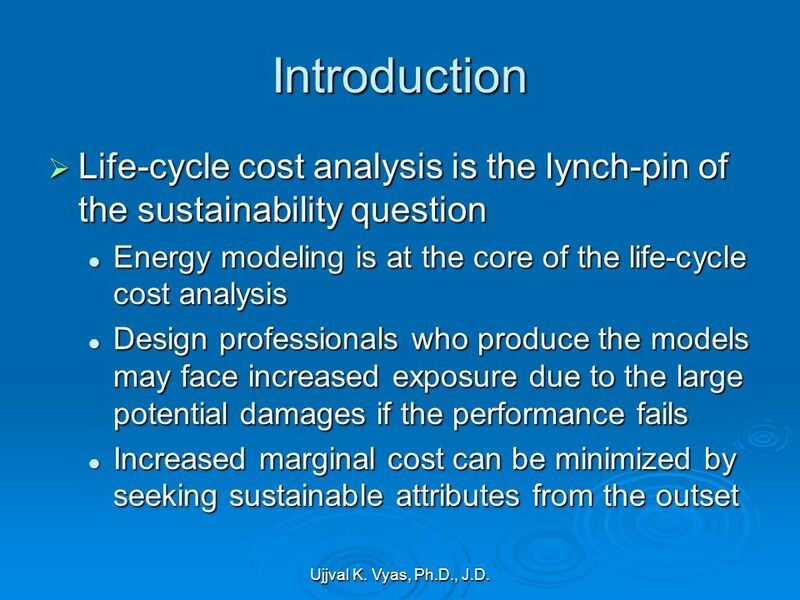 17 Ujjval K. Vyas, Ph.D., J.D. 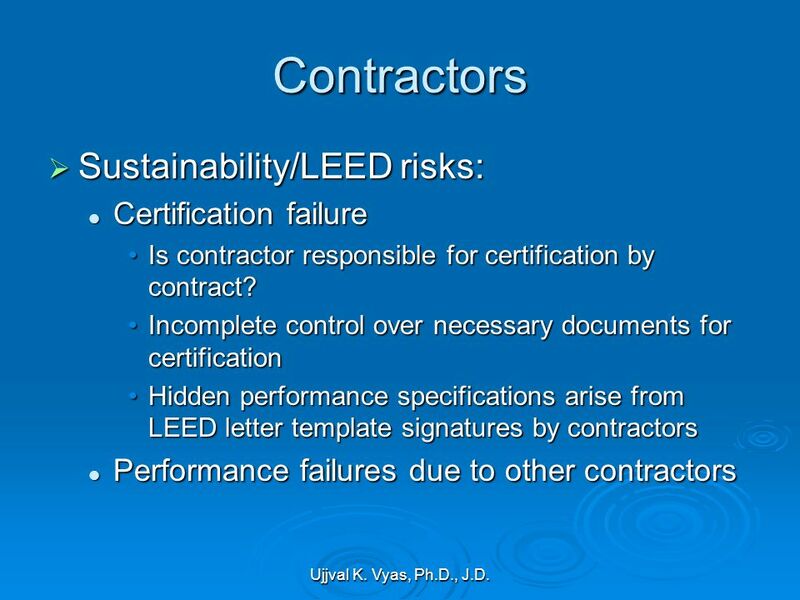 Contractors Should contractors develop LEED capabilities? 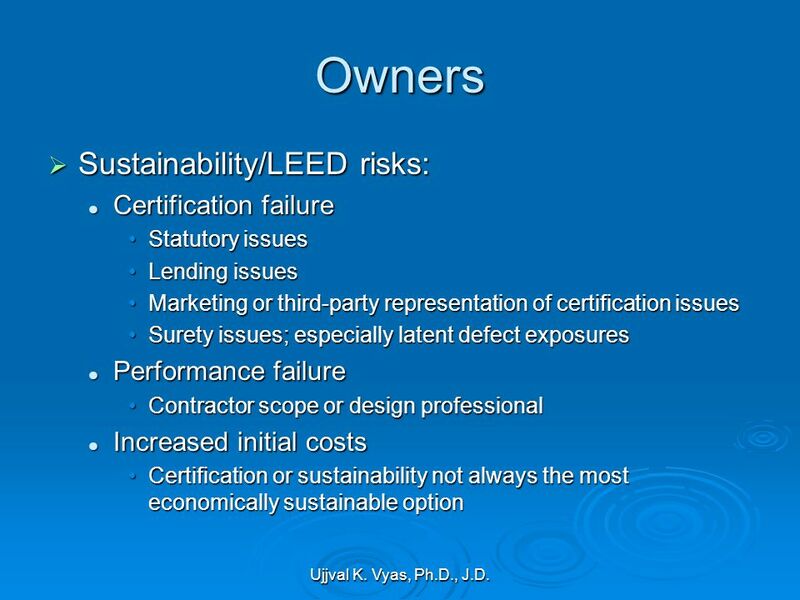 Should contractors develop LEED capabilities? 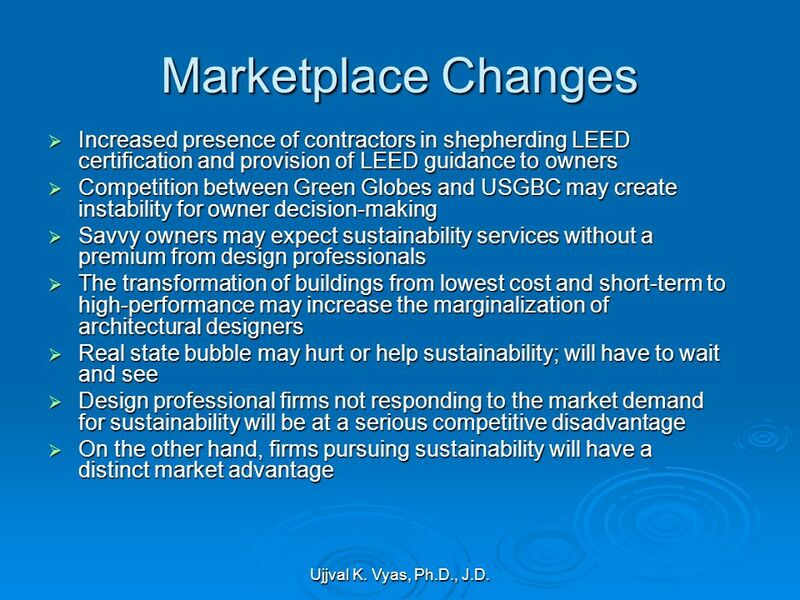 Yes, if they want to be responsive to the changing marketplace Yes, if they want to be responsive to the changing marketplace Yes, if they want to penetrate new markets Yes, if they want to penetrate new markets No, if their particular niche is generally unaffected civil engineering works for example No, if their particular niche is generally unaffected civil engineering works for example Yes, if some segment of their project areas will be affected Yes, if some segment of their project areas will be affected Maybe not, if they are already have capabilities beyond LEED, such as performance contracting or EPC contracting. 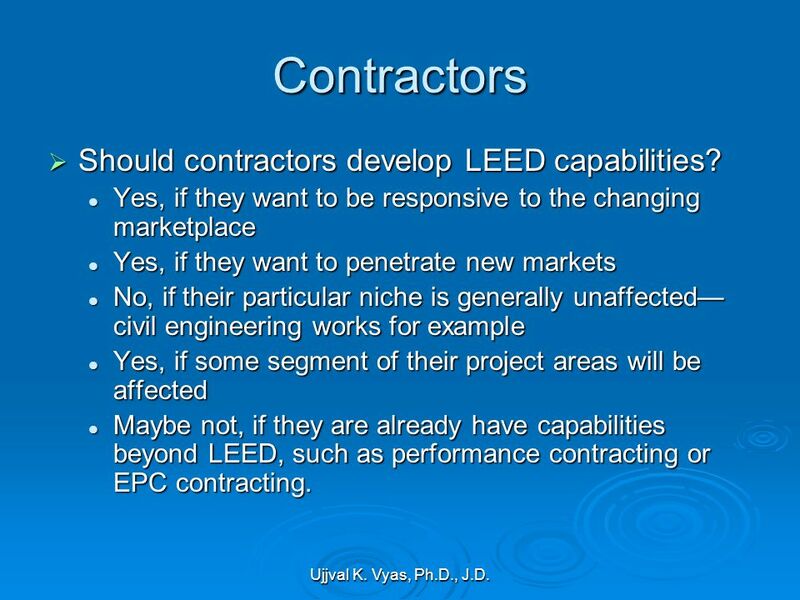 Maybe not, if they are already have capabilities beyond LEED, such as performance contracting or EPC contracting. 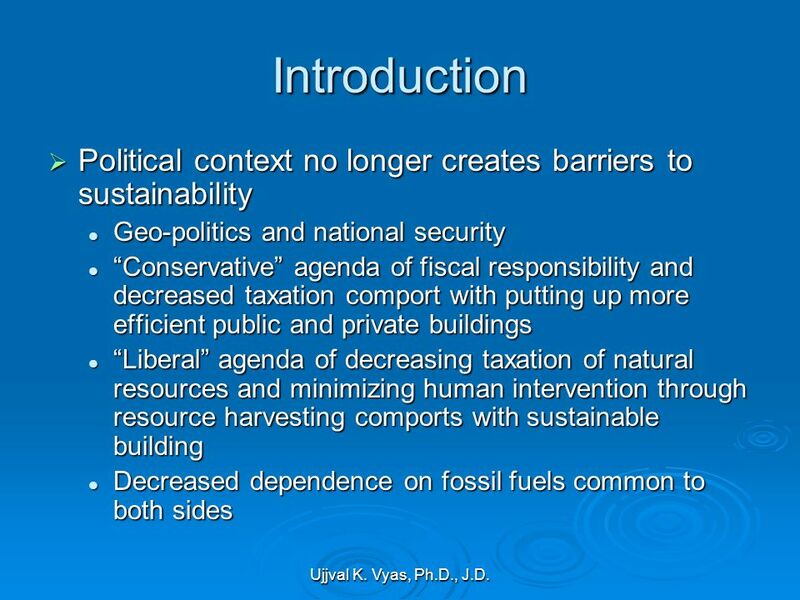 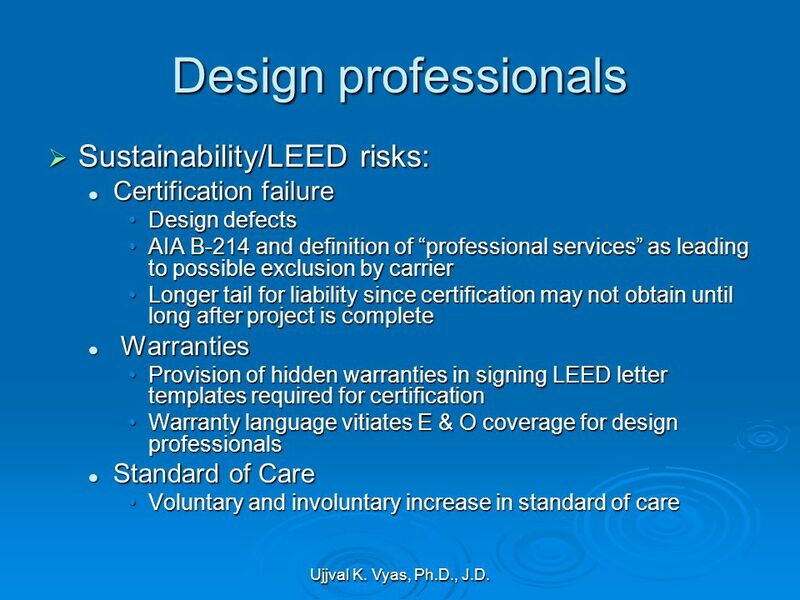 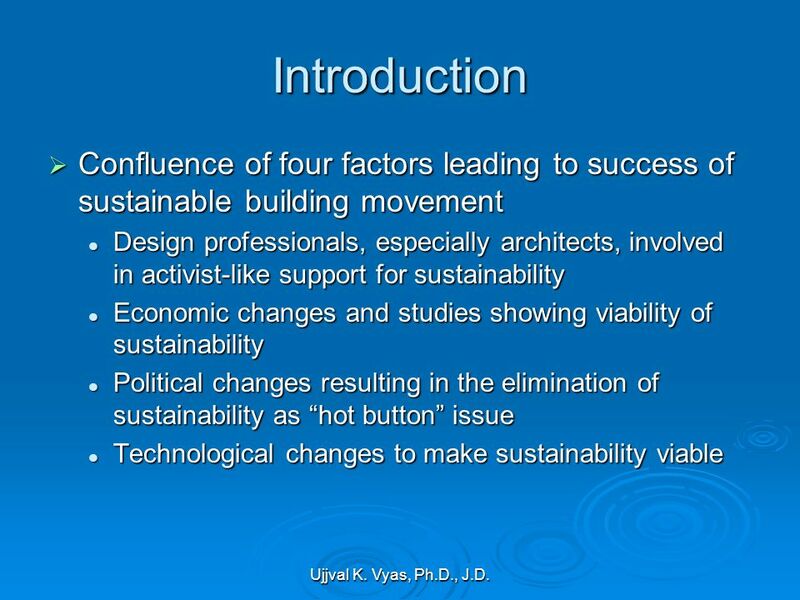 Download ppt "An Introduction to Sustainable Building: Risks and Opportunities BCBEC Presentation May 25, 2006 May 25, 2006 Ujjval K. Vyas, Ph.D., Esq., LEED AP Foran." 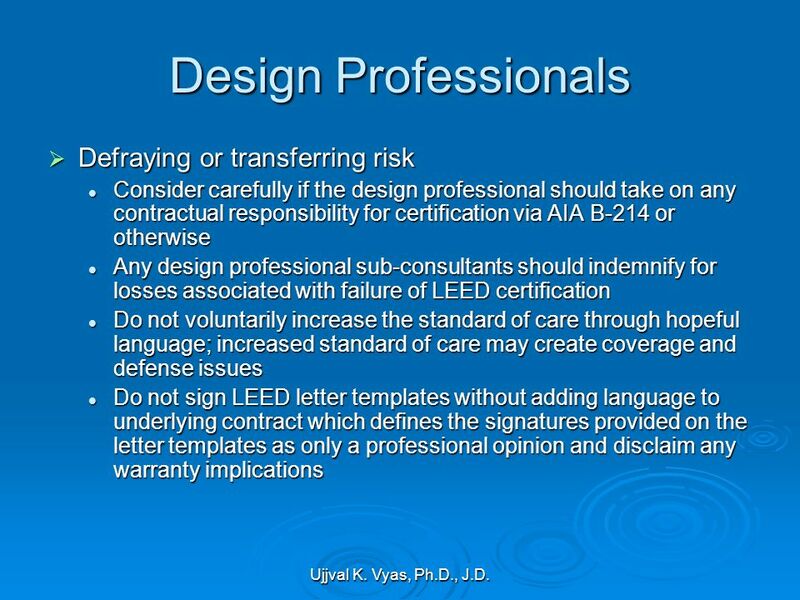 David DeLaRue, CPCU, ARM, AIC Senior Vice President National Project Insurance Practice General Liability Only Wrap-Ups. 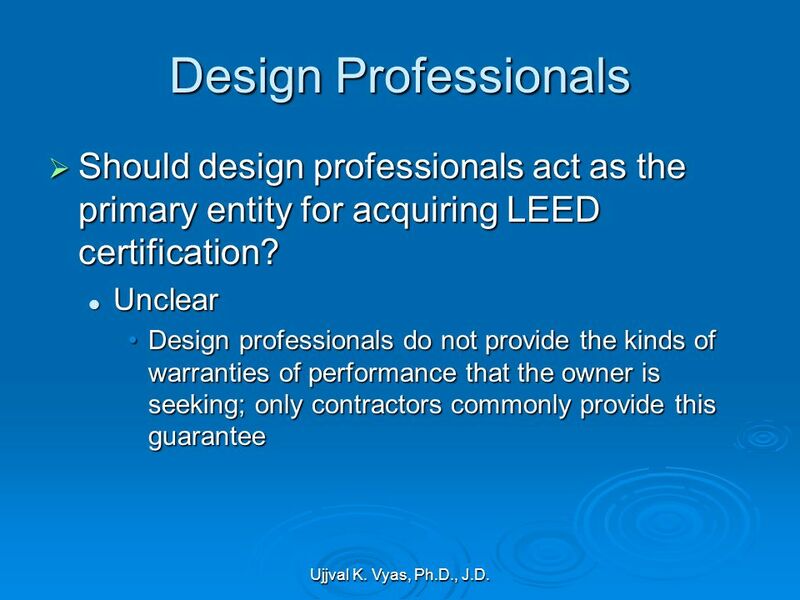 Jeffrey J. Vita – Saxe Doernberger & Vita, PC Timothy B. Walker – Willis North America San Antonio, Texas September 20, 2012. 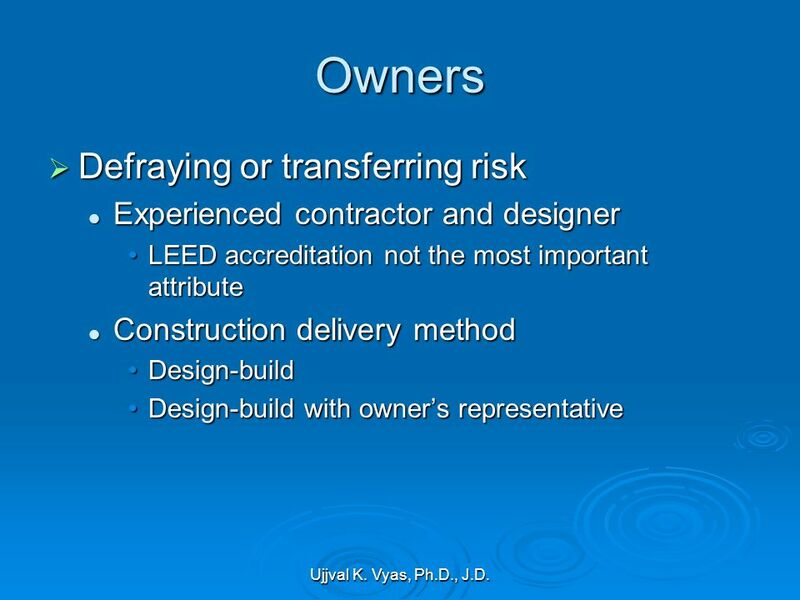 TRADABLE PERMITS IN WATERWAY TRANSPORT JIM FAWCETT ECONOMIST GALVESTON DISTRICT. 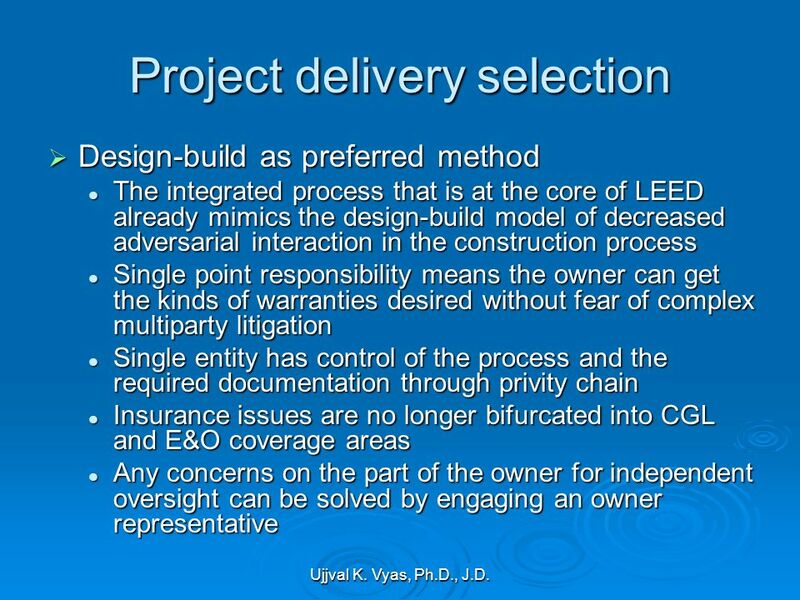 Design-Build: RISKS OR REWARDS for the Consulting Engineer? 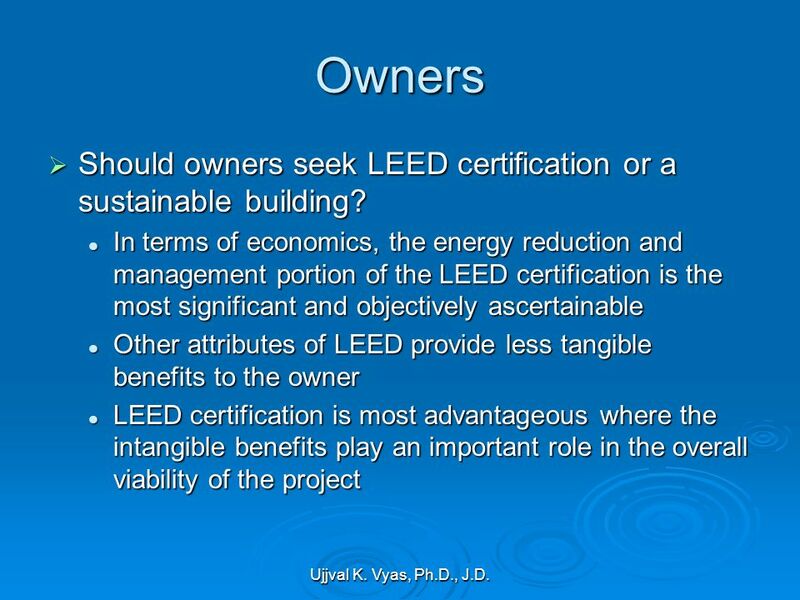 SEMINAR ON “NSC RECOMMENDATIONS ON CONTRCTUAL MINING” ON DATED 3 rd November, 2012 ORGANISED BY KUTCH LOCAL CENTRE OF MEAI, AHMEDABAD CHAPTER. 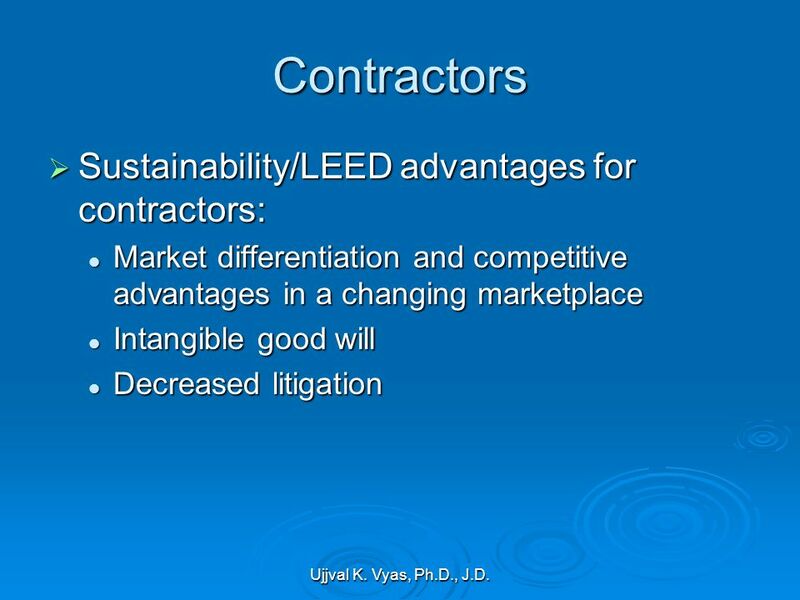 Antitrust/Competition Commercial Damages Environmental Litigation and Regulation Forensic Economics Intellectual Property International Arbitration International. 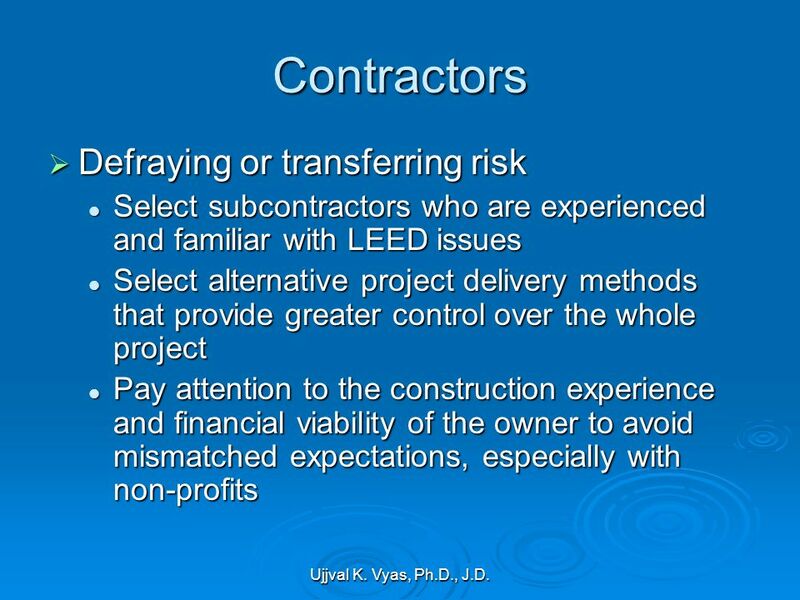 JOINT VENTURES General Contractors’ Risk Management Perspective. 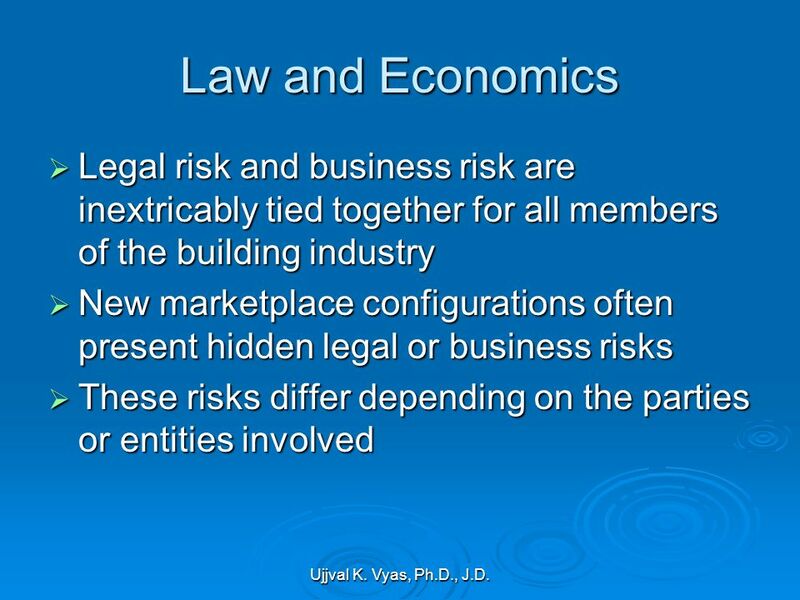 The Unique Risk of Construction Wrap-up Policies. 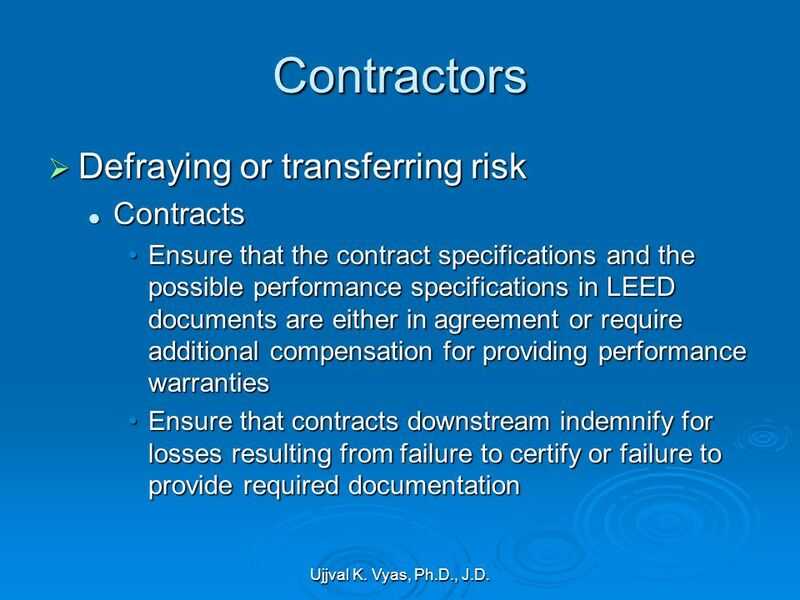 Managing Risk in Construction Contracts Brendan D. Bowles Glaholt LLP.